GC-TOFMS Application: Thermal decomposition analysis of antioxidant additive by TG-MS ーAccurate mass measurement with TG-TOFMS systemー | Applications | JEOL Ltd.
Thermogravimetry (TG) is a thermal analysis technique that measures sample weight changes during sample heating and provides sample thermophysical properties. Combining a TG with a mass spectrometer (MS) makes it possible to perform the qualitative analysis of organic compounds that are evolved as the sample weight changes. Typically, a general purpose quadrupole MS is used for these types of analyses. However, since the measurable m/z value of a quadrupole MS is nominal mass, this detector provides limited capabilities for the qualitative analysis of synthetic polymers, additives and unknown compounds. Alternatively, a time-of-flight mass spectrometer (TOFMS) can be used in combination with the TG to provide accurate mass measurement capability to identify the detected compounds. 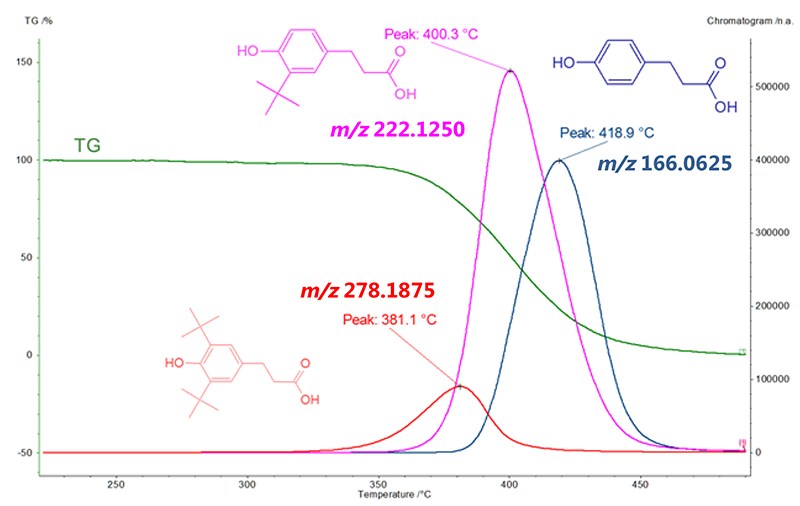 In this work, we measured an antioxidant additive by using a TG-TOFMS system. 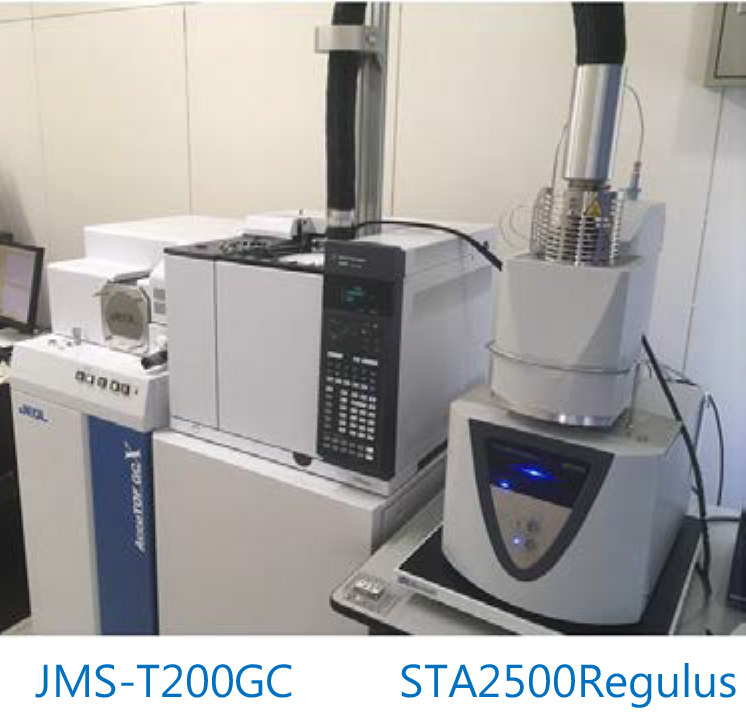 A fluorocarbon polymer was analyzed by using a JMS-T200GC "AccuTOF™ GC" (JEOL Ltd.), gas chromatograph / high-resolution time-of-flight mass spectrometer equipped with a STA2500 TG system (NETZSCH Co., Ltd.) as shown in Fig. 1. The measurement conditions are shown in Table 1. The GC was used as a thermostatic oven with a fixed temperature of 350 °C with blank capillary tube (3m X 0.25mm I.D.). The TG-EI-TOFMS measurement result for the antioxidant additive is shown in Fig. 2. 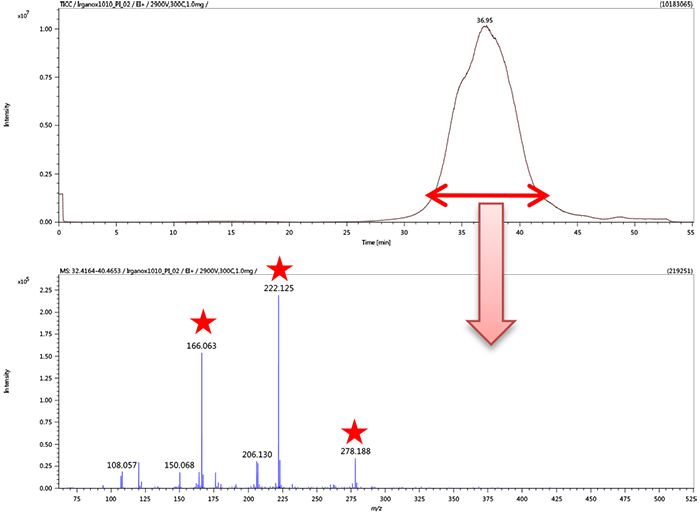 A broad peak was observed around 38 minutes on the TIC chromatogram where the TG temperature was ~350 to 450°C. This peak showed that the thermal decomposition of the antioxidant occurred in this temperature range. Next, the sample was pyrolyzed for qualitative analysis of the generated compounds. The EI mass spectrum is shown in the lower part of Fig. 2. Since the TG-MS data does not include chromatographic separation, multiple components are simultaneously ionized all at once. And, because EI is a hard ionization method, a large number of fragment ions along with their molecular ions are observed in the mass spectrum, all at once. As a result, it was very difficult to identify the thermal decomposition products using the EI data. Therefore, it was necessary to try PI (Photo Ionization), which is a soft ionization method, to look at the antioxidant thermal decomposition products, in which fragment ions are fewer than EI method and molecular ions are easily observed. The results of TG-PI-TOFMS measurement are shown in Fig. 3. The PI mass spectrum was much simpler and had less fragment ions than the EI mass spectrum. Table 2 shows the accurate mass measurement results for three of the high intensity ions (★ mark in Fig. 3) observed in the PI mass spectrum -- m/z 166, 222, and 278. These ions were estimated to consist of C, H and O, with an unsaturation number of 5. Based on these results, it is expected that these ions will have similar antioxidant core structures. The expected structural formulas for each are shown in Fig. 4. 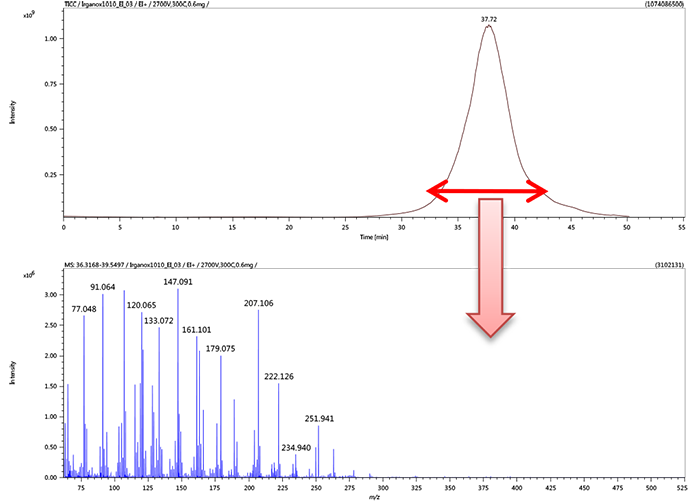 The TG/DTA curve of the antioxidant and the EIC chromatogram of m/z 166, 222, and 278 observed in the PI mass spectrum are shown in Fig. 5. The peak maximum for the m/z 166 EICC was observed at 420.6 °C, m/z 222 was observed at 399.7 °C, and m/z 278 was observed at 382.1 °C. These results show that the larger antioxidant was detected at lower temperatures while the smaller antioxidant was detected at a higher temperature. Fig.4　Suggested structure formula for m/z 166, 222 and 278. The qualitative analysis of multiple components observed at the same time can be performed by using a soft ionization method with TOFMS accurate mass measurements. TG-TOFMS is a powerful analytical tool for the detailed thermal analysis of synthetic polymer and additives.